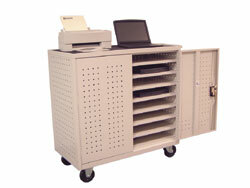 All-steel laptop storage cabinet cart and workstation with 24 compartments for storing laptop computers. Has wide, nonskid top surface for supplies and equipment. A surge suppressing electric assembly (LLTSE) can be purchased separately, which will allow powering the 24 laptops overnight. Consists of 4 six-outlet supressing electric (to purchase, select it as an option, w/the drop down menu on the left. The price is shown in the drop down menu).